We make sure that our moving trucks are clean and ready to deliver all your items to your new house, apartment or business. In addition, we have professional moving equipment such as straps, pads, and dollies to ensure that your items on the truck stay in place during the journey. When we arrive at the destination home or business, we want your items to be in the exact same condition that they were in when they were loaded onto the truck. This is part of what makes us different from other moving companies. 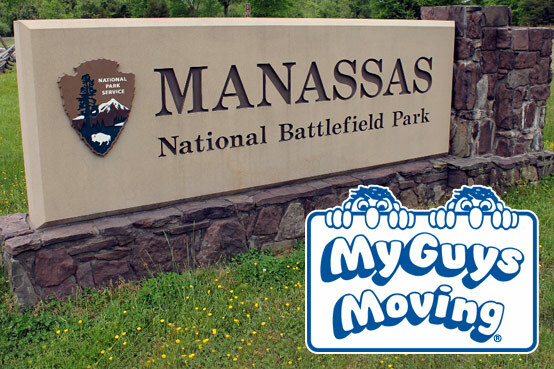 Manassas, VA customers can expect diligent, first-rate service from the beginning of the move to the end! We believe in providing dependable service at reasonable rates. You can get a free moving quote by filling out our simple form. We think people should receive an accurate estimate of what they will pay for the services of their movers. Manassas, VA residents deserve quality moving services without the surprise of a big bill. With our free estimates, our customers are able to decide on a moving budget that contains no surprises. A business owner or family making a move shouldn’t have to wonder about the reliability of their moving company. Our licensed, bonded, and insured moving staff arrives at the customer’s home or business on time and takes the most efficient route to the new location. Residents and business owners appreciate this professionalism that sets us apart from other moving companies in Manassas, VA. You can count on MY GUYS to take the stress out of the moving process! Call 703-988-0880 or simply fill out the Free Moving Quote form on this page and One of the Guys will be right with you! Thanks for contacting MY GUYS! Proudly moving Prince William County, Bristow, Broad Run, Catharpin, Catlett, Dumfries, Gainesville, Haymarket, Lake Ridge, Manassas, Montclair, Nokesville, Occoquan, Quantico, Triangle and Woodbridge. Best Moving Companies in Manassas, Virginia, 20108, 20109, 20110, 20111, 20112, 20136, 20137, 20143, 20155, 20169, 20181, 22025, 22026, 22125, 22134, 22172, 22191, 22192, 22193.